Data presented from the CDI Service Evaluation study shows that compared to traditional broad-spectrum antibiotics, first-line use of fidaxomicin in all CDI patients provides improved outcomes in terms of recurrence rate, all-cause mortality and cost effectiveness. CDI is associated with high-mortality and cost burden, therefore reducing the incidence and recurrence of CDI is a priority for clinicians, payers and health authorities alike. Presented today at the 5th International Clostridium Difficile Symposium (ICDS) in Bled, Slovenia [May 2015], the CDI Service Evaluation Study analysed a large dataset of over 1,450 CDI patient episodes. As a real-world multi-centre study, it assessed the effectiveness of current CDI treatment for UK patients in NHS Secondary Care Trusts in England. “CDI is a significant burden for patients and the NHS, and reducing its incidence and recurrence is a priority”, said Dr Simon Goldenberg, Consultant Microbiologist and Infection Control Doctor, Guy’s and St Thomas’ NHS Foundation Trust. Over 1,450 patient episodes were included in the analysis conducted in seven UK hospitals that introduced fidaxomicin, a narrow-spectrum antibiotic for the treatment of confirmed CDI in adults, between July 2012 and July 2013. Data collected were compared with a retrospective cohort treated with broad-spectrum antibiotics - vancomycin or metronidazole - during the previous 12-month period. Patterns of fidaxomicin use differed between the seven centres, with centres A and B treating with fidaxomicin as first-line treatment for all patients and the other five centres using fidaxomicin as first-line treatment only in selected patients for both primary and recurrent CDI. Data collected on 177 patient episodes treated first-line with fidaxomicin in centres A and B, showed a significant reduction in 28-day all-cause mortality, from 18.2% to 3.1% (P<0.001) and 17.3% to 6.3% (P<0.05) respectively. The real-world analysis also supports clinical trial data in highlighting dramatically reduced recurrence rates: from 12.1% and 23.5% in centres A and B with standard of care treatments (vancomycin and metronidazole), to 3.1% in both these centres where fidaxomicin was used first-line. For every 50 patients treated, this would result in 5 and 10 recurrences avoided in the two centres respectively. A CDI recurrence adds an additional £20,249 on top of the £13,146 spent to treat the initial infection due to prolonged hospital stay, ICU stay, high cost drugs and the surgery necessary to tackle it, as seen in the real-world evidence. An in-depth costing analysis at the two centres that adopted fidaxomicin as a first-line treatment revealed that in centre A the 5 recurrences that could be avoided for every 50 patients treated with the narrow-spectrum antibiotic would result in a cost saving of £19,490, and in centre B, for the 10 recurrences avoided, a cost saving of £121,144. 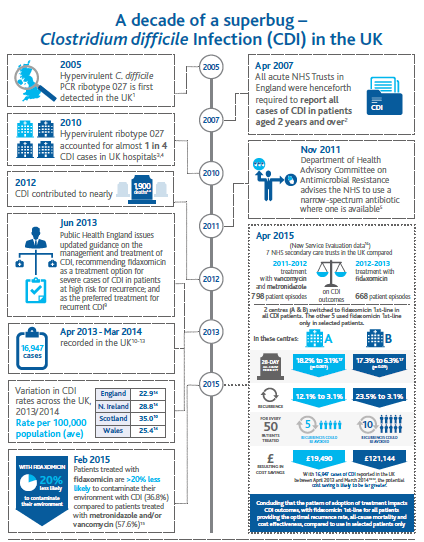 With 16,947 cases of CDI reported in the UK between April 2013 and March 2014, the potential NHS cost saving for the treatment of this potentially fatal condition is likely to be far greater. Guidance from Public Health England recommends fidaxomicin as an initial treatment option for severe cases of CDI in patients at high risk for recurrence; in addition, fidaxomicin is the preferred treatment for recurrent CDI.